Part family exploration, part personal narrative, this haunting and delicate debut collection weaves the mythic into the everyday. Drawing on her Greek heritage, Vana Manasiadis has Icarus crashing in Wellington storm, Theseus as a DOC ranger, and her grandfather, grandmother and mother threading their way through times, places and incarnations. Exploring the ex patria feeling of ‘being here and being there,’ she sews together Greece and New Zealand to create a playful and deeply moving journey. I lingered on each page to absorb the deliciously fresh lines and the nimble sound effects, then I gravitated to the chorus of voices. The poems build a maternal line from daughter through mother to grandmother in a tone of utter tenderness. Spanning waters, generations, and genres, Manasiadis does more than merely mix the mythological with the ordinary .... a cross-cultural poetic voice emerges confidently and provocatively inaugurating a text very much aware of its humour and the boldness of its manipulations .... This collection is a masterful debut, speaking with grace and candour to ancestry, migration, community, and love. [Ithaca Island Bay Leaves] feels both sure and tentative in the way of all exploration, and both visionary and intimate in the way of all good stories. The book hits notes of human resistance and resourcefulness again and again. But it has not a touch of piety in it, has in fact a really pungent wit and a sharp tongue .... Manasiadis dismisses no one and everyone has the best lines. 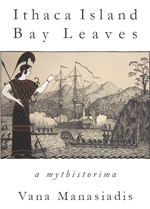 Ithaca Island Bay Leaves is alive with the re-telling of legends that shape and sustain cultural relocation; with acute observation and insight, and the warmth of Vana Manasiadis's alluring, original poetic voice. Vana Manasiadis was born in Wellington in 1973 and completed a Master of Arts in creative writing at Victoria University in 2005. In-between times she has taught classics, drama and English, and lived in Athens, Paris and Bologna. She currently resides in Crete. ​Pay by credit card or PayPal. Postage free within New Zealand. If you want to pay by direct credit, email contact@seraphpress.co.nz and we'll sort you out.